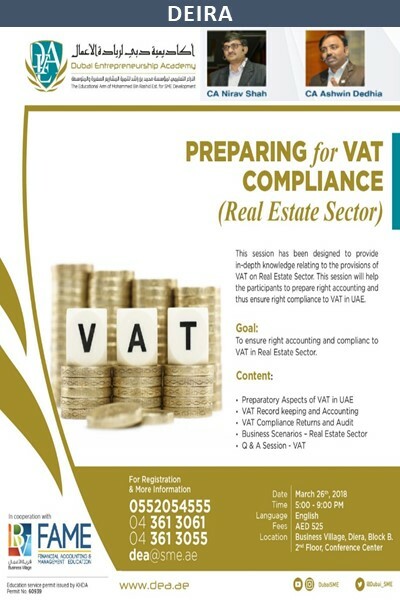 This is platform to connect all consultants, business men, professionals, or anyone who has question on VAT to ask their question and seek advices of others. Anyone can answer any question and share his or her knowledge. This platform aims at giving a single window to everyone to ask their question and also answer questions of others. If we export goods from Designated Zone and in invoice if we include clearing charges, freight and any other small expense incurred to make that export, should these expenses charged be considered as cost of goods or as separate supply of service? For example if we did a purchase or incur an expense in on period but received the tax invoice from supplier later in different period, is it ok to claim vat in a period different than invoice date. Can we claim input vat based on processing of invoices in system rather than invoice date period. For example in feb we incur an expense but receive invoice in April from supplier dated feb. We booked invoice in system in April and claimed vat in April return. Is it ok? We are getting the bills of less than 10,000 without our company name/ TRN. But the expense is our business purpose. Since less than AED. 10,000 transactions a simplified invoice can be issued without TRN number, can we claim this input Tax? Our Company is in Dezignated zone in Dubai and we are exporting to Foreign Countries. Since our export is out of scope of vat, can we recover the input tax paid against this supply? Central Bank uae published exchange rates to be used for translation in May 18. What about invoices raised and VAT return submitted before that? Will we need to revise those also? or can we use UAE central bank rates May onwards? If we export goods and in the invoice, along with goods price, if we include freight, clearing charges and any other small expenses incurred to exports these goods, will those charges be considered part of goods or as separate services?? A Free Zone Company not having any employees, has only one person who is the owner and manager of the Company. His Visa reflects the profession as an Investor. He is drawing salary from the company for CY 2017 in April 2018. Salary payable was not reflected in the financials of CY 2017. Are there any VAT implications of this transaction. If he were to draw salary for CY 2018, are there any VAT implications? Please quote the relevant legal provisions, if possible. Are exports from Dezignated Zone Zero rated or out of scope for VAT purposes? If a Dezignated zone company and Mainland Company are registered under a group, the transactions between the two should still be accounted under RCM (as goods are imported into mainland when DZ sells to mainland) or ignored for VAT purposes?? Questions, Replies and Views posted by users are their own based on their understanding of laws and regulations. Every person should use their own due diligence and discretion.